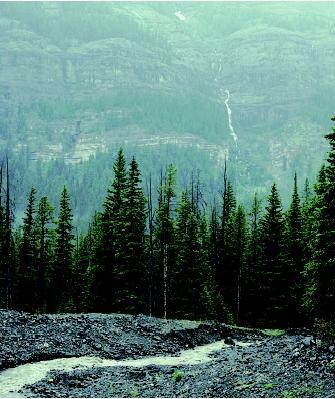 Rain falling on the landscape may flow quickly over soil or rock surfaces as runoff to stream channels. Alternately, some water may flow more slowly downslope toward streams within the soil. Some may percolate downward through pores in soil and fractures in rock to reach the top of the saturated zone (often called the water table). Below the saturated zone, it flows much more slowly as groundwater . Soil characteristics, plants and animals, and slope angle are among the natural factors controlling the proportion of precipitation that is converted to runoff in a given landscape, and the time it takes for runoff to enter a stream. Human changes to these landscape features can greatly influence runoff. Grassed filter strips in farm fields help reduce runoff and erosion by slowing water velocities in the vegetated areas. 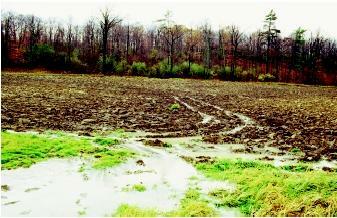 Grassy strips also reduce erosion by trapping excess sediment, nutrients, and farm chemicals. Vegetation (including dead vegetative materials) in prairies, forests, and other natural areas plays a similar role. The soil surface acts as a filter that lets water pass through (infiltrate) at a rate known as the infiltration rate or infiltration capacity. Runoff may be produced when precipitation or snowmelt adds water to the soil surface faster than it can be absorbed. The excess water remains on the surface and flows downslope as runoff. For example, if the precipitation rate is 5 centimeters (about 2 inches) per hour, but the infiltration rate is only 2.5 centimeters (about 1 inch) per hour, surface runoff is produced at the rate of 2.5 centimeters (about 1 inch) per hour, even if the soil is not entirely saturated. This mechanism of runoff generation is more common in drier climates where vegetation cover is sparse. In humid areas with greater vegetation cover, the water table may lie at the surface in low-lying areas or slope hollows, so that the soil there is saturated. Saturated areas expand during rain or snowmelt, as well as during the cold season when plants withdraw little water from the soil. Any rain that falls on these saturated areas must run off over the surface. In times of prolonged heavy rainfall, large areas of a gently sloping landscape may become saturated, and much of the rain that follows runs off rapidly to streams. This was the case during the devastating Mississippi River flood of 1993, when much of the landscape in the Upper Mississippi River Basin appeared as a "lake" on satellite images that detect surface water. Infiltration rate is controlled by the nature of the soil, by the plant and animal communities it supports, and by human influences. Where soil is absent and little-fractured bedrock is exposed, water cannot soak in and will run off rapidly. If soil is present, but is very fine-grained and clay-rich, the pore spaces that water must pass through are extremely small; hence, water will infiltrate very slowly compared to sandy soils that readily soak up water. Some finer-grained soils have vertical cracks that form when the soil shrinks as it dries. These cracks allow water to enter more readily, but may close up after the soil is wetted. Compaction of soils reduces the size of pore spaces and the infiltration rate. Water commonly runs off areas that were compacted through repeated passage of people, large animals, or heavy machinery. Raindrops falling on bare soil also can compact the soil surface in plowed fields, leading to increased runoff and erosion of farmland. Ice within the pore spaces of frozen soils typically reduces infiltration rates, but only soils that were saturated on freezing will completely prevent water from entering. Summer melting of the upper layer of permafrost in cold regions often results in a saturated zone of soil above the frozen ground. Precipitation that falls as snow is stored until snowmelt, when a large pulse of runoff may be generated. Runoff occurs only after the entire snowpack has reached 0°C (32°F), some melting has occurred, and pore spaces between snow grains can no longer hold all the water supplied. The rate of snowmelt depends on heat inputs into the snowpack through solar radiation and via water from melting and rainfall moving through the snow. The soil surface underneath the melting snowpack may become saturated, such that runoff flows through the base of the snowpack toward streams. Saturated zones and surface runoff commonly occur on slopes below the melting snow line . In general, plants and small animals tend to increase the infiltration rate of soils. Some water usually evaporates from plant surfaces before it can fall to the soil surface. A plant cover and litter layer of dead vegetation protects the soil surface from compaction by heavy raindrops, and also slows the delivery of water to the soil surface. Plant stems help slow down water that flows over the soil surface. Plant roots help create openings in the soil, and also draw water from beneath the soil surface and transpire it through leaves back to the atmosphere. Decayed plant matter helps keep fine soil particles (such as clay) from sticking together, thereby increasing infiltration capacity. The burrowing activities of small animals such as insects, worms, and gophers also help keep the soil loose and create small openings through which water can pass. When the landscape is completely devegetated, for example, following a forest fire or during a construction project, a dramatic increase in runoff and soil erosion may result. In desert environments where much of the soil surface lacks vegetation and where bare rock is exposed, most of the rainfall in heavy thunderstorms runs off rapidly and flash floods are common. Yet in dense, humid forests, vegetation and thick, loose soils may absorb water so readily that water rarely runs off the surface. Steep slopes in the headwaters of drainage basins tend to generate more runoff than do lowland areas. Mountain areas tend to receive more precipitation overall because they force air to be lifted and cooled. On gentle slopes, water may temporarily pond and later soak in. But on steep mountainsides, water tends to move downward more rapidly. Soils tend to be thinner on steep slopes, limiting storage of water, and where bedrock is exposed, little infiltration can occur. In some cases, however, accumulations of coarse sediment at the base of steep slopes soak up runoff from the cliffs above, turning it into subsurface flow. Rain falling on areas where unfractured bedrock is exposed has little opportunity to infiltrate, and instead will run off the surface. A brief thunderstorm in Yellowstone National Park produced considerable surface runoff from these steep cliffs. much less likely to cause flooding, but is faster than the creeping flow of groundwater in the bedrock below. Urban development can greatly increase the amount of precipitation that is converted to runoff in a drainage basin. Most paved surfaces and rooftops allow no water to infiltrate, but instead divert water directly to storm channels and drains. Urbanization is of serious concern to water resources for several reasons. First, the increased amount of water flowing to streams during storms causes larger floods, and floods build to a peak faster because of the rapid flow of water over smooth surfaces. Second, motor vehicles leave oils and exhaust residues on streets, and household and industrial chemicals also collect on pavement surfaces. These nonpoint-source pollutants are readily washed off during storms, contaminating streams into which urban runoff flows. Careless disposal of hazardous wastes on streets or in storm drains adds to the problem. Third, most precipitation has no chance to percolate downward to groundwater, so the supply of groundwater to wells is reduced. Some cities have taken steps to reduce these impacts. Pavement can be constructed so that some water passes through to recharge groundwater, and storm runoff can be routed to artificial basins that allow water to soak in. Along with regulation of hazardous industrial wastes, programs have been developed to educate the public about the dangers of improper disposal of wastes on streets and in storm drains. SEE ALSO Desert Hydrology ; Erosion and Sedimentation ; Forest Hydrology ; Hydrologic Cycle ; Karst Hydrology ; Pollution Sources: Point and Nonpoint ; Stream Hydrology ; Wastewater Treatment and Management. Dingman, S. Lawrence. Physical Hydrology. Upper Saddle River, NJ: Prentice Hall,1994. Dunne, Thomas, and Luna B. Leopold. Water in Environmental Planning. New York:W. H. Freeman, 1978. Selby, Michael J. Hillslope Materials and Processes. Oxford, U.K.: Oxford UniversityPress, 1982. Yair, Aaron, and Hanoch Lavee. "Runoff Generation in Arid and Semi-arid Zones." Hydrological Forecasting, Malcolm G. Anderson and Tim P. Burt, eds. New York: John Wiley & Sons, 1985.